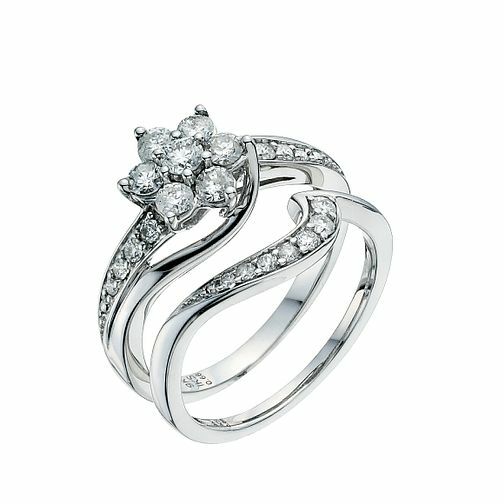 Perfect Fit 9ct white gold 0.75 point diamond daisy cluster bridal set. A large daisy cluster with channel set diamond shoulders. The matching wedding ring is designed to fit perfectly beneath the engagement ring. 9ct White Gold 3/4ct Diamond Perfect Fit Bridal Set is rated 5.0 out of 5 by 7. Rated 5 out of 5 by Anonymous from This ring is so different from other engagement rings It looks amazing on the hand. Beautiful features. And I love it came as the set as it is looking stunning when I am wearing both. Great quality. Definitely recommend this product. Rated 5 out of 5 by Anonymous from Piece of art This ring is not like other engagement rings, it is a piece of art work, is beautiful and different. It has the wow factor ! !